The general chemical characteristics of the alkaloids are so broadly spread out, therefore, they shall be treated individually under the following heads, namely. [A] N-in the Molecule Besides, the other normal elements e.g., carbon, hydrogen, oxygen, the alkaloids must essentially contain at least one N-atom. The number of N-atoms vary from the bear minimum one in a molecule e.g., cocaine, to even five in a molecule e.g., ergotamine. It has been observed that these N-atoms are normally present as a part of the heterocyclic ring in the alkaloid molecule e.g., quinine, reserpine, strychnine, vinblastine and yohimbine; whereas there are certain alkaloids that contain the N-atom in the aliphatic side chain e.g., ephedrine, mescaline. 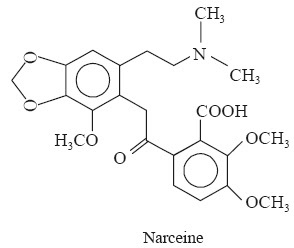 Invariably, the alkaloids contain the N-atom in the tertiary-amine form (R3N) e.g., morphine, reserpine; lesser in the secondary-amine form (R2NH) e.g., ephedrine; and very rarely in the primary-amine form (RNH2) e.g., nor-pseudo-ephedrine. Furthermore, whenever N-atom occurs either in the tertiary- or secondary-form, it essentially constitutes as an integral part of the ringsystem, precisely the heterocyclic ring system. 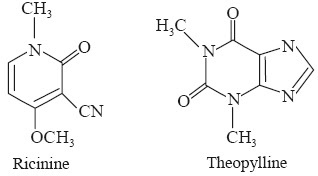 Noticeably, the tertiary N-atoms wherein only two of the bonds are involved in a ring, the methyl moiety is usually found as the third component, for instance: N-methyl group in morphine, cocaine, colchicine, dextro methorphan, codeine, physostigmine, vinblastine, vindesine etc. Hence, methyl moiety seems to be the only alkyl group that has been found to be substituted on the N-atom. (ii) Chemical properties are quite different. As a matter of convenience, they are legitimately grouped along with the alkaloids. [B] O-in the Molecule In addition to the common elements C, H and N, a variety of alkaloids normally contains O-atom. Invariably, these specific alkaloids are found in the solid state, with a few exceptions where the oxygenated alkaloids usually occur as non-volatile liquids, such as: pilocarpine. [C] Basicity (Alkalinity) In general, the alkaloids are basic (alkaline) in reaction, by virtue of the presence of N-atom present in the molecule. Hence, these are prone to the formation of their respective salts with various acids. Degree of Basicity: The degree of basicity of the alkaloids mostly depends upon the prevailing influence caused due to the electrostatic status of the N-atom present in the alkaloid molecule, for instance, the number of N-atom present in the alkaloid, whether the N-atom is located in the ring or in the side-chain, the presence of alkyl group (e.g., methyl) to the N-atom etc. 1. The weaker bases, i.e., alkaloids having low pKa values, shall require a more acidic medium to form their respective salts with the corresponding acid. 2. The strongly basic alkaloids i.e., those possessing high pKa values, shall require comparatively low acidic medium to form their respective salts with the acid. Note: In a medium at a weakly acidic pH certain strongly basic alkaloids would be easily converted to their respective salt by interaction with the corresponding acid, whereas the alkaloids which are relatively weaker bases having lower pKa values shall still remain in their free-base form. Such a critical situation is skillfully exploited for the separation of a specific alkaloid or a group of alkaloids having closely identical pKa values, from other alkaloids that essentially possess either very low or very high pKa values. 3. The alkaloids are usually neutrallized with acids to form salts that may be converted to the corresponding free-base by the cautious addition of selective weak bases, such as, ammonia, calcium hydroxide or sodium carbonate. The usage of either NaOH or KOH solutions must be avoided so as to prevent the decomposition or destruction of highly sensitive alkaloids. 5. Unstable alkaloidal salts: There exists some specific alkaloids that inherently possess weakbasic properties and their salts are not so stable, for instance: piperine, papaverine, narceine, narcotine, and caffeine. (b) For ascertaining whether a specific extraction procedure has exhausted completely the alkaloidal contents or not. However, a negative test i.e., the absence of precipitation, may infer that the alkaloids are absent. It is pertinent to mention here that a positive test may not always indicate the presence of alkaloids, but may also be due to the presence of other plant constituents, such as: purines, proteins, betaines and ammonium salts etc. Therefore, it is always desired to rule out the possibility of a false-test by alkalifying the acidic solution with dilute ammonium hydroxide and subsequently extracting the liberated alkaloid with chloroform. The residue thus obtained, after the removal of the solvent (chloroform), is tested with the alkaloid-precipitating reagents. Now, if the test is positive, the presence of an alkaloid is almost confirmed. Microcrystalline precipitates of alkaloids: Alkaloids, alike other amines, usually form doublesalts with salts of heavy metals, such as, gold (Au), mercury (Hg) and platinum (Pt). The resulting double salts are found to be possessing characteristic microcrystalline structures. It has been observed that under controlled and specific experimental parameters viz., profile of mixing and gradual evaporation, a drop of an alkaloidal solution reacting with a drop of an appropriate alkaloidalprecipitating reagent, such as: chloroplatinic acid (H2PtCl6) or chlorauric acid (HAu . Cl4), on a microscopic-glass slide, gives rise to microcrystalline products having specific and characteristic shapes and structures solely based upon the manner of aggregation. * It may, however, be exploited skillfully as a convenient means of rapid-microscopical identification of an alkaloid. Note: Acidify with nitric acid to litmus paper. A saturated solution of Picric Acid. A 1% (w/v) solution of phosphomolybdic acid in ethanol. A 1% (w/v) solution of silicotungstic acid in distilled water. Note: Filter and store in a refrigerator. [E] Colour Reactions with Specific Reagents Broadly speaking the colour reactions of the alkaloids are rather unspecific; however, they are certainly very sensitive so much so that even alkaloids present in microgram quantities invariably afford immediate and instant response. The ultimate development of a characteristic colour reaction is solely dependent upon either the dehydration or the oxidation of the alkaloid. Generally, a large number of these reagents essentially consist of concentrated sulphuric acid along with certain specific added compounds, such as, sulphomolybdic acid, formaldehyde, sulphovanadic acid, potassium arsenate, hydrogen peroxide, and selenious acid. (a) Froehd’s reagent: Dissolve 5 mg of molybdic acid or sodium molybdate in 5 ml of pure concentrated H2SO4. Note: The reagent should be freshly prepared before use. (b) Erdmann’s reagent: A mixture of 10 drops of concentrates HNO3, and 100 ml of water are added to 20 ml of pure concentrated H2SO4. (c) Marqui’s reagent: A mixture of 2-3 drops of formaldehyde solution (40%) with 3 ml of concentrated H2SO4. (d) Mandalin’s reagent: Dissolve 1 g of finely powdered ammonium vanadate in 200 g of pure conc. H2SO4. (e) Mecke’s Reagent: Dissolve 1 g of selenious acid in 200 g of pure concentrated H2SO4. (f ) Modified Dragendroff’s reagent: Dissolve 1.6 g of bismuth subnitrate in 60 ml of 20% glacial acetic acid, add to it 5 ml of 40% aqueous solution of KI, 5ml of glacial acetic acid and make up the volume to 100 ml of water. (g) Rosenthaler’s reagent: Dissolve 1 g of potassium arsenates in 100 g of pure concentrated H2SO4. (h) Schaer’s reagent: Mix carefully 1 volume of pure 30% H2O2 with 10 volumes of concentrated H2SO4. Note: The reagent is always prepared afresh, before use. (i) For Ergot Alkaloids: The blue colour produced by the ergot alkaloids with the Van Urk Reagent (or Ehrlich Reagent) i.e., para-dimethylaminobenzaldehyde in 65% H2SO4, is employed for the quantitative estimation of ergot alkaloids. (ii) For Belladona Alkaloids: The violet colour caused by the belladona alkaloids with fuming HNO3 and alcoholic KOH solution is employed for their assay. (i) Ergotamine gets destroyed by prolonged treatment with alkali, whereas strychnine can stand such vigorous action. (ii) An aqueous solution of alkaloids undergo rapid decomposition or degradation as compared to their solid forms. (iii) Storage of alkaloids in pure form or their dry extracts is usually done in a vacuum desiccator over a dehydrating agent e.g., phosphorous pentoxide (P2O5) or calcium chloride (CaCl2) anhydrous for their better stability. (iv) During the course of extraction of alkaloids followed by isolation, the solvent is preferably removed effectively by distillation under vacuum** (or reduced atmospheric pressure) or by subjecting it to evaporation in a Rotary Thin-Film Evaporator under vacuum so that the desired product is not exposed to excessive heat, thus avoiding decomposition. (v) Alkaloids, are stored in amber-coloured glass bottles preferably in a vacuum desiccator. [G] Acid salts of Alkaloids A plethora of alkaloids are strongly alkaline in nature and most of them form well-defined salts. However, in certain instances the basicity of an alkaloid is quite weak and feeble, and hence the formation of the corresponding salts with either acetic or other weak acids is practically insignificant and rare. The salts formed with stronger acids e.g., HCl, H2SO4 etc., get decomposed in the presence of water to liberate the free base and the acid. It has been observed that only a few of the alkaloids form carbonates, and consequently either the alkali carbonates or the alkali hydrogen carbonates are invariably used to liberate them from the aqueous solutions of their corresponding salts. Alkaloids, in general, containing either one or more than one N-atom usually behave as monoacidic bases; and, therefore, form only one series of salts with acids as designated by ‘BA’ (where: B = base; and A = acid). It is pertinent to mention here that quinine in particular and the cinchona alkaloids in general are an exception to the earlier concept and found to behave as diacidic bases. Besides, a number of alkaloids to behave as monoacidic bases, even though they contain two N-atoms in their molecule. It is worthwhile to mention here that the basicities of the alkaloids is of utmost importance with regard to their quantitative volumetric estimation. (CH3I) while giving rise to the corresponding hydroxy base. The methoxyl group (s) are present in a variety of alkaloids, for instance: codeine, quinine, narcotine and papaverine. (c) Hydrolysis: A good number of naturally occurring alkaloids are obtained as esters. They easily undergo hydrolysis on being heated with either alkalies or mineral acids thereby resulting into the formation of the corresponding acids along with respective alcohols or phenols of the alkaloids. (a) Dilute alkaline solutions of KOH or NaOH normally decompose most alkaloidal salts and finally liberate the free alkaloids. (b) Certain alkaloids containing phenolic hydroxyl groups e.g., morphine, on being treated with alkaline solutions yield, their corresponding soluble sodium or potassium salts. (c) The ester alkaloids usually undergo hydrolysis on being treated with dilute alkalies, such as: atropine, cocaine. (d) Racemic Isomeride: The action of alkali hydroxides on hyoscyamine in alcohol gives rise to the racemic isomeride atropine. (e) Fusion of alkaloids with dry KOH or NaOH by the application of heat ultimately leads to drastic decomposition of the former thereby yielding ultimately the simple heterocyclic bases, for instance: pyridine, quinoline, pyrrolidine etc. (f ) Simple fusion of alkaloids with alkali hydroxides may give rise to distinct and visible colour changes. 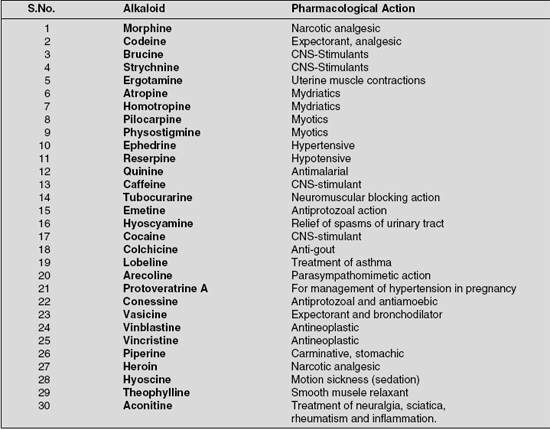 [I] Pharmacological Activity The alkaloids exhibit a wide-spectrum and complete diversity of complex structures which ultimately is responsible for their extra ordinary broad-range of pharmacological activities covering both the cardio-vascular and central nervous system. It has been observed beyond any reasonable doubt that most alkaloids usually exert certain specific and definite pharmacological action. Moreover, a small quantity of an alkaloid (0.1–1.0 mg) may bring about a marked and pronounced pharmacological action on various organs and tissues both of animal and human origin. However, the potency of an individual alkaloid varies from one another widely and profusely. * A whole combination of several components. 78.5°C boils in vacuum at 40°C.